Eight years after he wore the pink jersey in the Tour of Italy for three days, Italian veteran Matteo Tosatto is back in the lead of a stage race – the Tour of Qatar. The Quick Step rider was the first of his squad to cross the line at the end of the six kilometre team time trial in Doha on Sunday – the same stage which they won last year. Slipstream – who have Dave Millar and Magnus Backsted in their Qatar line-up – finished second, two seconds down. Dutch squad Skil were third, five seconds back. ?Before the start my team-mates ? led by Tom Boonen ? decided that I would be the first to cross the line.? the 34-year-old Tosatto told reporters afterwards. ?I consider this leader?s jersey is a reward for years of long service.? ?Matteo is more than a team-mate, he?s become a friend as well. He spends most of his time working for the rest, so now it?s his turn to get in the limelight.? Boonen added. 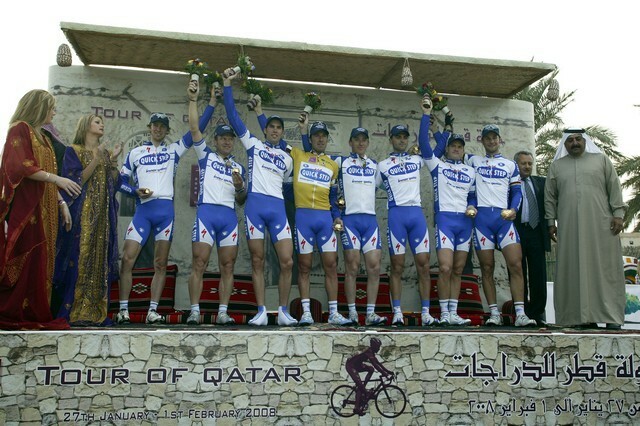 Already the winner of 11 stages of the Tour of Qatar, Boonen could well add a twelfth to his palmares on Monday?s first mass-start stage ? 137 kilometres long and widely expected to end in a bunch sprint.